In this paper, Nano-poly(3,4-ethylenedioxythiophene) (PEDOT) particles with different morphologies and different degrees of oxidation were prepared by reverse interface method. Nano-PEDOT materials with different morphologies were configured as ink-jet printing inks. The printability of the ink was determined by the analysis of ink dispensability and stability, rheological properties, droplet flight speed, the volume of ink droplets ejected. The results found that nanoparticles with higher degree of polymerization, larger aspect ratio and specific surface area had better dispersion. The best surface tension of ink was 30–40 mN/m and the best viscosity was 8–20 mPa s. The piezoelectric frequency didn’t exceed 10 kHz with the best printability. Good ink-jet printability effectively solved the production failures and product defects by the traditional metal nano-ink, which had been reunited and clogging. The ink application could reduce the complexity of processing methods by using the precursor printing. So the nanoparticles ink could be used in the patterning of transparent electrodes and functional layers of electronic devices. And full play to the advantages of printed electronics and products. This research work was funded by the 2018 discipline construction fund of the School of Light Industry and Engineering, South China University and Technology and the Guangdong Science and Technology Plan Project (2017B090901064) and the Guangzhou Science and Technology Plan Project (201607020045). 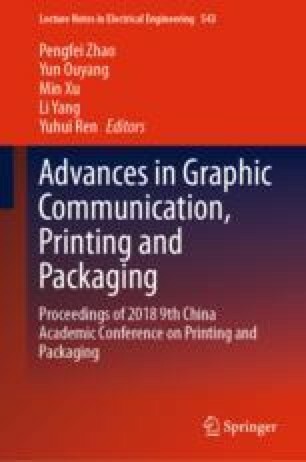 At the same time, it is also the research content of “Research and application of printing process of conductive and luminescent materials” by Guangdong Caile Packaging Technology Co., Ltd. Thanks to Shenzhen Yutong Technology Co., Ltd. for providing research equipment in the special fund of Shenzhen development and reform commission (No. 939, 2016).